First, you check your meter on a known source of voltage to see that its working properly. Any nearby power receptacle should provide a convenient source of AC voltage for a test. You do so and find that the meter indicates as it should. 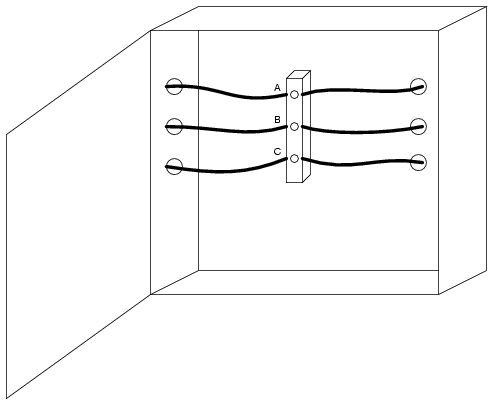 Next, you need to check for voltage among these three wires in the cabinet. But voltage is measured between two points, so where do you check? The answer is to check between all combinations of those three points. As you can see, the points are labeled "A", "B", and "C" in the illustration, so you would need to take your multimeter (set in the voltmeter mode) and check between points A & B, B & C, and A & C. If you find voltage between any of those pairs, the circuit is not in a Zero Energy State. But wait! 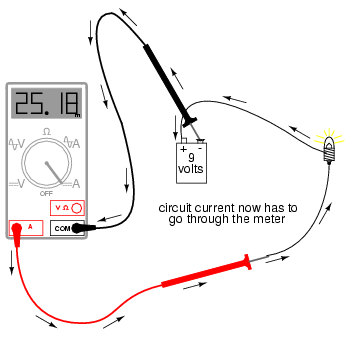 Remember that a multimeter will not register DC voltage when its in the AC voltage mode and vice versa, so you need to check those three pairs of points in each mode for a total of six voltage checks in order to be complete! However, even with all that checking, we still haven't covered all possibilities yet. Remember that hazardous voltage can appear between a single wire and ground (in this case, the metal frame of the cabinet would be a good ground reference point) in a power system. So, to be perfectly safe, we not only have to check between A & B, B & C, and A & C (in both AC and DC modes), but we also have to check between A & ground, B & ground, and C & ground (in both AC and DC modes)! This makes for a grand total of twelve voltage checks for this seemingly simple scenario of only three wires. Then, of course, after we've completed all these checks, we need to take our multimeter and re-test it against a known source of voltage such as a power receptacle to ensure that its still in good working order. 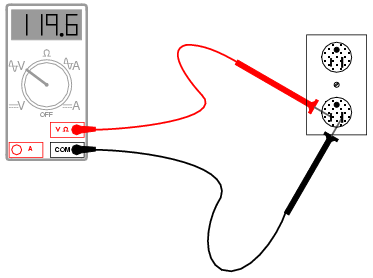 Another potential hazard of using a multimeter in its current-measuring ("ammeter") mode is failure to properly put it back into a voltage-measuring configuration before measuring voltage with it. The reasons for this are specific to ammeter design and operation. 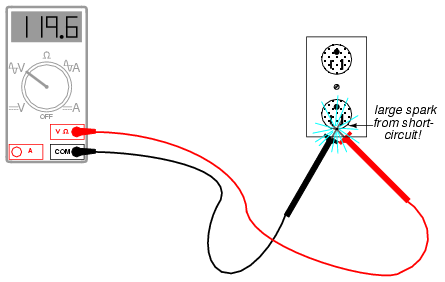 When measuring circuit current by placing the meter directly in the path of current, it is best to have the meter offer little or no resistance against the flow of electrons. Otherwise, any additional resistance offered by the meter would impede the electron flow and alter the circuits operation. 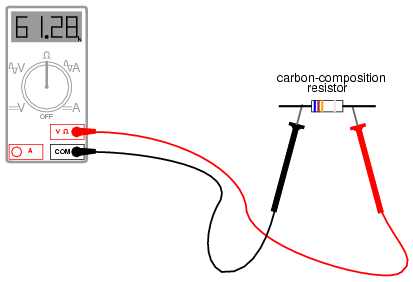 Thus, the multimeter is designed to have practically zero ohms of resistance between the test probe tips when the red probe has been plugged into the red "A" (current-measuring) socket. 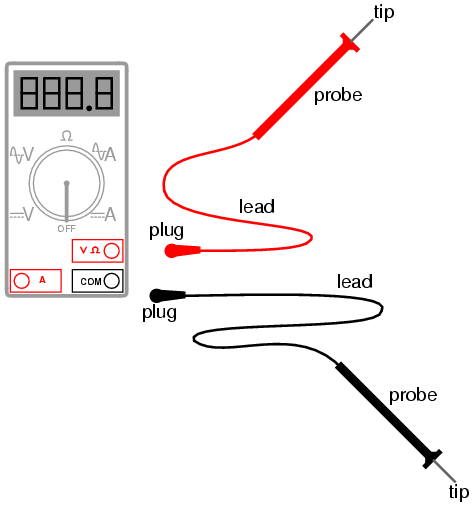 In the voltage-measuring mode (red lead plugged into the red "V" socket), there are many mega-ohms of resistance between the test probe tips, because voltmeters are designed to have close to infinite resistance (so that they don't draw any appreciable current from the circuit under test). 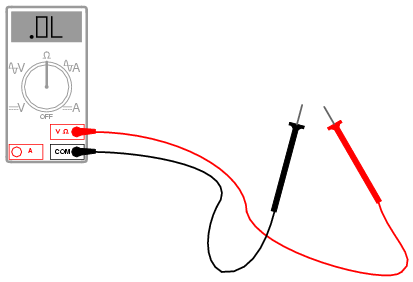 When switching a multimeter from current- to voltage-measuring mode, its easy to spin the selector switch from the "A" to the "V" position and forget to correspondingly switch the position of the red test lead plug from "A" to "V". 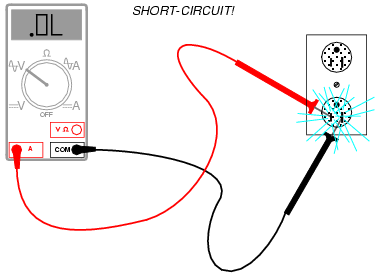 The result -- if the meter is then connected across a source of substantial voltage -- will be a short-circuit through the meter! 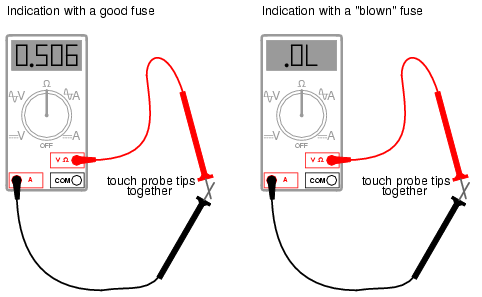 A good fuse will indicate very little resistance while a blown fuse will always show "O.L." 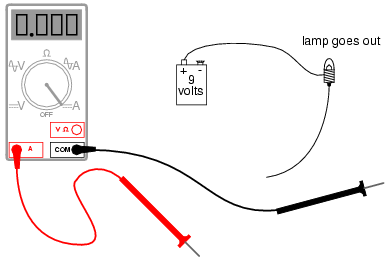 (or whatever indication that model of multimeter uses to indicate no continuity). The actual number of ohms displayed for a good fuse is of little consequence, so long as its an arbitrarily low figure.